In this section we have the usual questions that are asked about thatch. Please search the site if you want to find an answer quickly or, if you cannot find the answers you need on these pages please feel free to contact us and we will be happy to help. Should I use spark arrestors? No they are actively discouraged as the disadvantages of keeping them clean and clear outweigh the advantages. 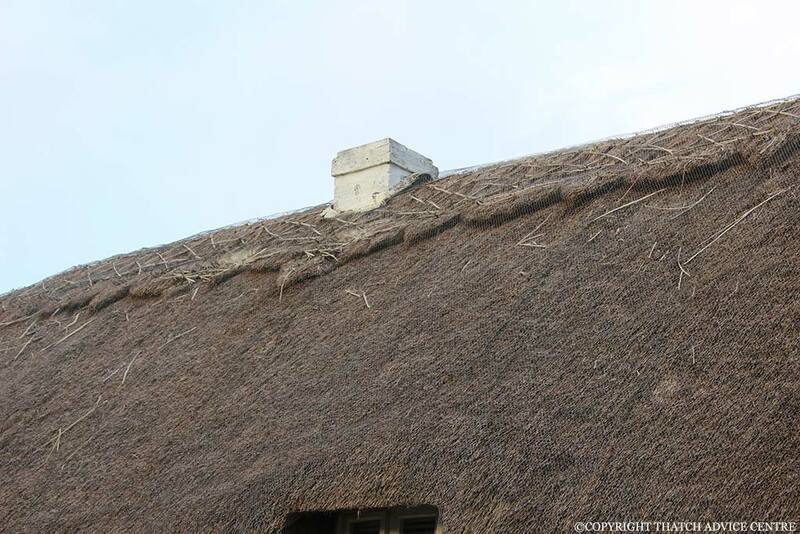 What is a safe chimney height above the thatch? 1.8 Metres is the minimum recommended height. I want to install a Woodburner in my thatched property, what advice can you give me? 1. Check with your insurance company on implications. 2. Check your chimney’s suitability. 3. Contact a specialist, you must get the appropriate size woodburner for your room and an insulating chimney liner is essential. The chimney pointing needs checking. Keep your chimney well swept and burn seasoned wood. Last but not least check that you have the appropriate insurance cover. Birds are pulling the straw out of my thatch, what can I do? Firstly try to deter them. Ideally apply wire netting to the affected areas or the whole roof. Deterrents are available. I have holes in my roof along the ridge and the thatch looks messy what is happening? It appears that you have vermin in your roof. Call out a pest control specialist to eliminate them immediately and then call your thatcher to inspect your roof and repair it. In addition check that your wire netting is secure and there are no other ways the vermin can get in. I have a lot of moss and lichen on my roof, is it detrimental to my roof? Moss and lichen generally grow on the lee side of a roof especially where there are overhanging trees. They hold water and will accelerate the roof wear. Routine thatch maintenance i.e. new ridge will mean the thatcher removes the moss and lichen and tidies the main coat work on the roof. It is not recommended to remove it if the roof is nearing the end of its life as it could do more harm than good. 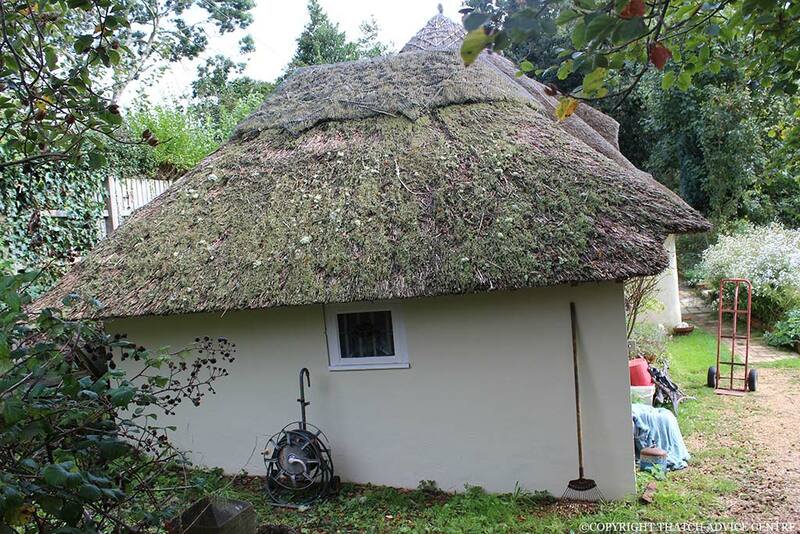 Are there any grants available to help finance a re-thatch? I want to thatch my gazebo myself, how would I go about it? Thatching is not as easy as it looks, perhaps buy artificial thatch or use reed mats/fencing from a garden centre to give the right effect. There are a lot of factors to take into account if you still want to have a go, give us a call for more advice. How does thatch keep the weather out? A combination of its compactness and the steep pitch of a thatched roof mean water runs off the roof by dropping from one end of a stem of reed to another. Why don’t most thatched roofs have gutters? Generally because of the thickness of the thatch the bottom projects far enough away from the walls of the property to shed the water away from the walls. What therefore happens to the water run-off? Some new properties have a soak-away trench – filled with small stones, but with a lot of properties the water just finds its own way of soaking into the ground or drying on the surface of the ground. Can I have gutters on my roof? It is not usual but yes you can. Metal brackets are made for the gutter which is often made of timber and is V shaped. Some properties have them over the doorways. Is it the case the thicker the thatch the better? No it is not the thickness of the thatch, but the pitch of the reed on the roof that is the crucial element in shedding water. Often a thick coat of thatch will have a slacker pitch. The length of the reed or straw also has a role to play. What is the ridge made of? In the UK ridges are made from straw or sedge because this is most traditional and the easy to use. Are thatched roofs expensive to insure? It is best to shop around the thatch specialists depending on your individual property as fire safety measures may well reduce premiums. How is a thatched roof fixed? Nailed, tied or stitched/screwed to the roof, and with a recoating job, sparred to a base. 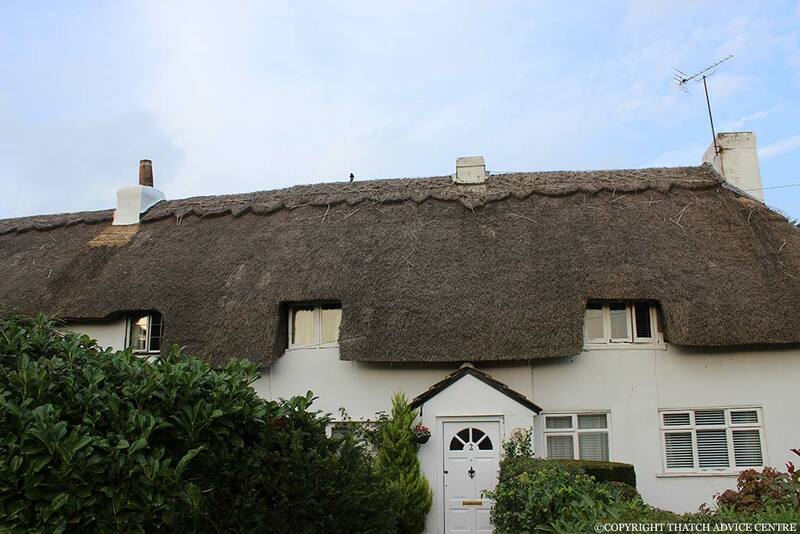 Can any roof be thatched? Yes, as long as it is steep enough. A 45° angle is the minimum requirement for a suitable thatched roof. How much does thatch weigh? Roughly 7lbs per square foot or 34 kg/m2. I have an existing roof that I want to strip of tile and have thatched. What special construction features should I be looking at? Most roofs require very little alteration. The pitch, wall plates, barges and windows are the main areas that need consideration. Contact us to find specialists to help you.